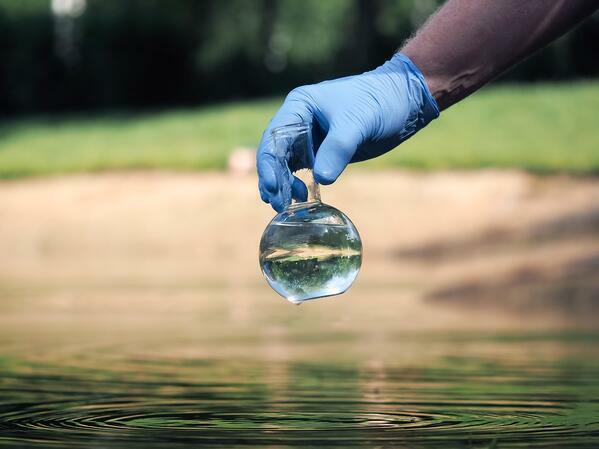 Total dissolved solids (TDS) refers to the amount of ionized solids that have been dissolved in a solution. If you were to add table salt to a glass of water, the salt granules would eventually dissolve, making it difficult to gauge how much salt was present. Using a TDS tester, you can determine the quantity of solids (in this case, salt) dissolved in the water without evaporating the liquid and transforming the salt back into a solid state through a process known as gravimetrics. Rather than using gravimetrics, TDS meters test the electrical conductivity (EC) of a liquid. Ionized salts are the most common form of TDS and can be found in both organic and inorganic material, making them ideal TDS indicators. Because salts are composed of positive and negative ions, you can determine the salinity of a solution by measuring its net EC. Pure H2O is not capable of conducting electricity and will produce an EC reading of zero. The more positively charged salt ions that are present, the greater your EC readings will be. Although the gravimetric method will reveal exactly how much TDS is present, it’s inefficient and often impossible to accomplish in the field. In addition, a variety of organic material is temperature-sensitive and may be destroyed in the boiling and evaporation process. Furthermore, the accuracy of your TDS readings depends on the sophistication and accuracy of the scales used to weigh the residual solids. Although TDS meters don’t require the use of scales or other equipment, they do require you to measure temperature, as well as EC. A substance with a higher temperature will generate a higher EC reading, regardless of TDS levels. For this reason, testing temperature and EC together ensures reading accuracy Digital TDS meters today will automatically compensate for temperature when calculating TDS levels in parts per million (ppm). TDS testers come in the form of portable, benchtop, or in-line meters, making it easy to collect data in a lab, a manufacturing plant, or in the natural world. Because meters automatically convert EC into the standard ppm units and account for temperature variation, they also streamline the testing process. That said, it’s exceptionally important to keep the conversion factor on your meter consistent between readings to ensure accurate results. While TDS meters can tell you the amount of solids dissolved in water, they don’t actually reveal what those dissolved substances are. Instead, TDS is used as a general, quick and easy indicator of contamination and a metric for tracking changes over time. According to the EPA, drinking water should have a TDS reading of about 500 mg/L or less in order to be considered safe to consume. In addition, the EPA outlines which dissolved substances are acceptable in drinking water and in what quantities they’re allowed. When the net TDS level climbs above the accepted threshold, it’s usually a sign of greater contamination and is considered a health hazard. In other instances, determining the implications of TDS readings is more complex. EC measurements don’t differentiate between organic and inorganic matter, so it’s impossible to determine if TDS levels are the result of inorganic pollutants or natural mineral deposits. Although high TDS levels are often labeled as “bad,” the nature of TDS readings is actually very contextual. Some surface water contains high levels of TDS because of naturally occurring elements and processes. Although that water may be unfit to consume, those higher TDS levels are likely important to the surrounding ecosystem. For that reason, it’s important to evaluate TDS readings within the right framework. Although TDS meters are often used to measure the amount of active sanitizer in pool water, it’s important to remember that TDS levels do not necessarily represent the amount of sanitizer present. Rather, they reveal all TDS that’s present in the water, including organic material. Before adjusting the amount of sanitizer in the pool, you should always conduct a measurement to identity pH, free chlorine, combined chlorine, alkalinity, cyanuric acid, and even copper levels to get a better sense of the existing chemical balance. In natural settings, it can be harder to pinpoint the source of elevated TDS levels. If you have an idea of the potential contaminants that could be at fault, you can conduct a lab analysis to check for the presence of those specific elements. The elements you test for should be informed by the nature of your environment and the potential contaminants therein. For example, if you’re testing surface water near an agricultural plant, you may decide to test for chemicals found in fertilizers which may have entered the water via runoff. For more information about how to interpret TDS readings and use TDS testers, be sure to research your chosen tester’s unique features and applications. To shop Jenco Instruments’ variety of water quality monitors with TDS testing capabilities, click the button below.